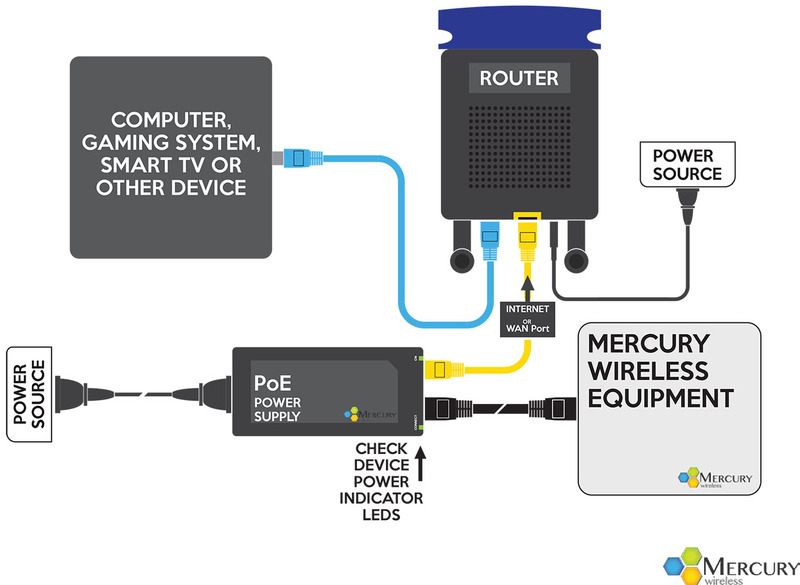 If your Mercury Wireless service isn’t working, here are a few simple fixes you can try. Before you try any fixes, check to see if there is a reported outage in your area. Call (800) 354-4915 and press Option 2 for Support. If there are no reported outages for your area, you can try the trouble-shooting steps below. If you have verified all connections are secure and plugged in correctly, it may be helpful to restart your devices. Power cycle your wireless router. In most cases this can be done by removing the AC adapter cable from the rear of the device, allowing 10 seconds for it to power down, and plugging the AC adapter cable back in. If there is no wireless router present, perform a full restart of your PC, Tablet, or other Internet connected devices. Once you have restarted your devices, allow 1-2 minutes for devices to fully power on and connect before checking your connection again. Located the PoE referenced in diagram 1-a. This power adapter will be located inside the home or business and should resemble a small power brick with LED indicator lights active. Remove the AC (power) cable from the rear of the PoE. This cable will be plugged opposite the side with Ethernet cables. Allow 10 seconds for the device to power down. 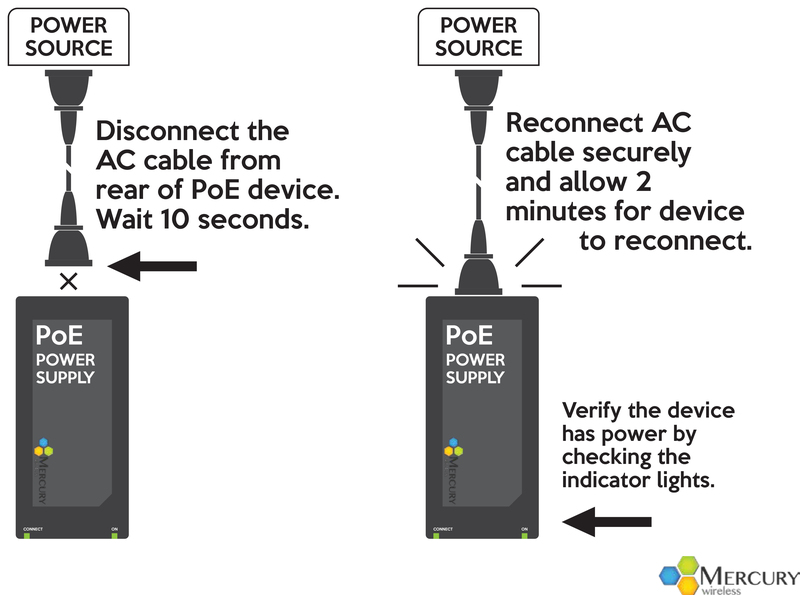 Reconnect the AC cable to the rear of the PoE and make sure the connection is secure. Allow 2 minutes for the Mercury Wireless equipment to re-connect to the network, and test your connection again. IF you have restarted both your personal devices and the Mercury Wireless equipment but are still experiencing a connection issue, follow the steps below to check for the presence of an Internet connection when plugged directly in to the Mercury Wireless equipment. Verify the PoE adapter has power. This can be done by verifying the AC cable is plugged into a outlet and checking for the presence of an indicator light. 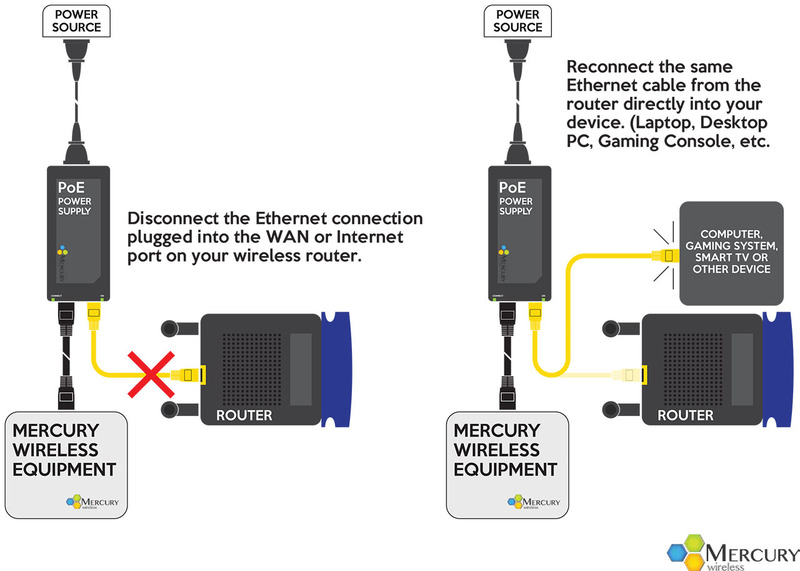 Disconnect the Ethernet connection plugged into the WAN or Internet port on your router. This is often marked WAN, Internet, or highlighted by a yellow box on the rear of the wireless router. Plug this same Ethernet connection directly into your PC laptop or desktop. 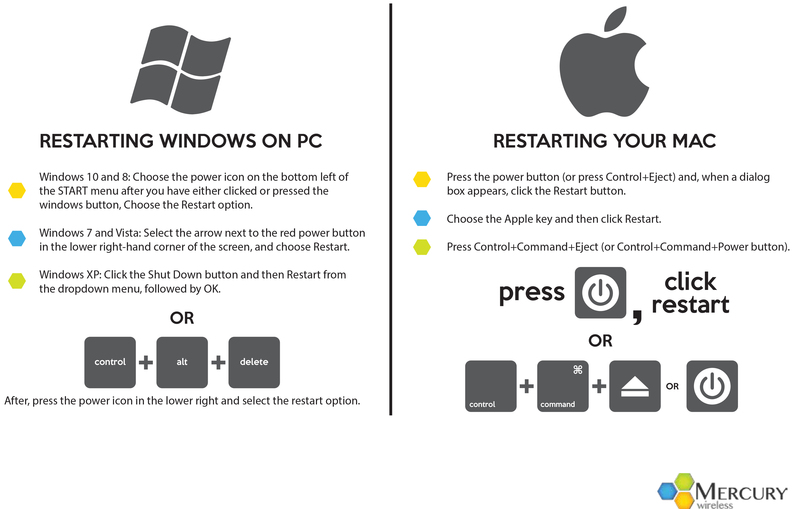 Perform a full restart of your computer. If your Mercury Wireless service still isn’t working after trying the trouble-shooting steps above, contact our support team for further assistance. Submit an inquiry at our Contact page.